All the world knows about Einstein the scientific genius. But what about Einstein the matchmaker? 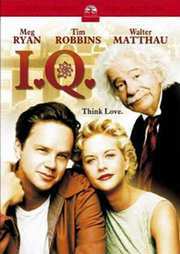 I.Q. puts this fanciful notion to the test and comes up with winning results in this fun warm-hearted romantic comedy that has critics and audiences cheering. Walter Matthau gives one of his greatest performances as the famed physicist who must solve a particularly vexing problem - how to lure his spirited niece Catherine (Meg Ryan) away from her stuffy British fiance (Stephen Fry) and into the arms of her perfect love match... a sweet-natured auto mechanic (Tim Robbins). It will take all of the professor`s smarts (and wiles) to transform the grease monkey into a shining knight. But never underestimate the mind of Uncle Albert - or the power of love.